After playing the game Dig for Dinosaurs on our interactive whiteboard we have become very interested in dinosaur bones. The children started making their own dinosaur fossils with rocks they found out in the playground. 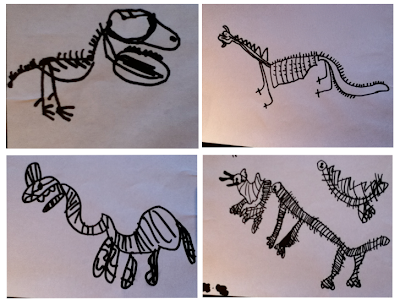 We then looked at some photographs and silhouette drawings of dinosaur bones and drew our own dinosaur skeletons. The children's rock dinosaurs reminded me of an idea I had seen on Designing Early Childhood Australia - a salt dough Stegosaurus. 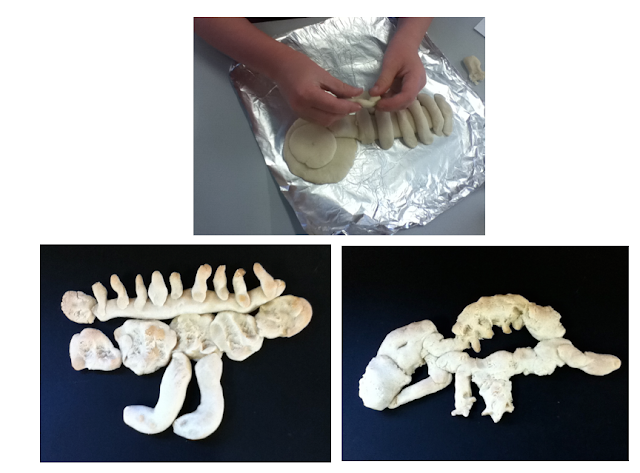 So we whipped up a batch of salt dough and the children got to work turning their drawings into 3D dinosaur fossils. These are wonderful!!!! I love them, really! I'm gathering ideas for my son's 4th birthday (dinosaur themed) so thank you for posting these on It's Playtime! I love the rock dinos.